For a Unique Judaica Experience to rejuvenate your creativity - fun for all ages! 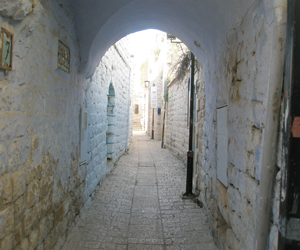 Ruth Knapp's work is on display at the Soul Art Gallery located in the Artists' Colony, in the Old City of Safed and at the Erentrou Judaica Gift shop on Jerusalem Street. From San Francisco, California to Boston, Massachusetts, through Cameroon, Africa, Ruth settled in Eretz Israel to live and create her unique Judaica artworks (view video link below). Ruth lived 17 years in Jerusalem where she founded her company, jerusalemclay, and has now joined the Galil for its fresh air and inspiring mountains. Ruth has experience working with special children (at Alyn children's hospital), and with the elderly and alzheimer's patients (through Melabev as an Art Therapist). Ruth is available to host birthday parties, a family day with clay (all ages invited) and other special events, 5 to 50 people; or enjoy private pottery lessons for women, ceramics for kids, or art therapy for the elderly.